Every now and again I trawl through Amazon's free Kindle book listings. It can take some time selecting what may be of interest and can be a hit and miss affair. Seeing we were going to spend many hours in planes in June and, needing some lightweight reading distraction, I went through the exercise. Below are some of the results of the search. Adventures in Spain introduces us to a young Scottish lady who leaves her teaching position in Glasgow to pursue a lifetime ambition of living in a foreign country and becoming immersed in its culture and language. She moves to Spain during the Franco years and teaches in a bilingual school as well as tutoring English privately. As is typical of this genre, you will get a chuckle and perhaps even a laugh out loud moment as you read about her inevitable language problems, the memorable and sometimes quirky people she encounters and the situations she gets herself into. 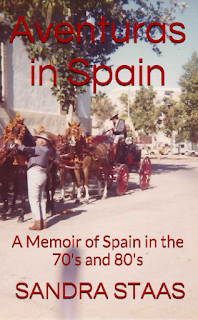 Travel along with Sandra as she becomes a married woman and mother during the turbulent years of Franco's regime and the Spanish transition to democracy (La Transición) following his demise. Normally I am not 'into' murder mysteries but Rosemary for Remembrance came with lots of positive feedback. It is the story of a young attorney investigating the death of her elderly client's sister in what appeared to be a hit and run. The thing is it happened more than 50 years before and the inquest then listed the death as misadventure. The client is convinced it was murder and wants the matter cleared up before she dies. From initial inquiries it is obvious that there has been some sort of cover up. Many of the dead woman's contemporaries are still alive and the attorney's investigations stir up a hornet's nest to a point where she is in danger. I have to say I really liked this book with all its twists and turns, some great characters and a good blend of present and past narrative. Sometimes you should really take note of an Amazon category when deciding on books but, after looking through 30 or so web pages, the brain tends to numb. I found out half way through that The Art of Falling fell under 'Women's Romance' (I know, in hindsight, the cover says it all) so it is what it says on the label. Entertaining, light and fluffy. A feel good read with all the usual cliches of the genre. Back in September 2013 I reviewed the first book in the Ben Hood series by Australian author Drew Lindsay. Black Mountain Affair is the second book and written in the same style. Again a bit of reality suspension is needed but the characters are larger than life, the dialogue and humour genuinely Australian as is the North Queensland setting. The plot may be a bit contrived to include an Aboriginal Australian theme but who cares. An entertaining and worthwhile read if you have a few hours to spare. I grew up with The Three Stooges, Abbott and Costello and Martin and Lewis on the big screen. They were standard fare at the Saturday matinees. And Laurel and Hardy re runs were on TV. This book covers all their careers and personal lives and is an interesting insight into these legends of comedy. Bridget is the story of the author's great grandmother Bridget Vaughn Wilson who left Ireland penniless in 1851 to escape starvation during the potato famine. She spent most of her subsequent life in Savannah GA, where she faced many tragedies and experienced many events we now read about in history books eg. The Civil War. Despite being labeled an historic novel this story is true and is the result of many years of research by the author. Although a relative short book, I found the background to the great surge of Irish emigration to the USA, the horrific conditions endured during the journey and the struggle to begin a new life in a foreign country fascinating. Flowers in the Snow is a story of the racial divide in 'the South' during the 1960s through the eyes of a young girl with a social conscience. But living in a small segregated town with her KKK father and subjugated mother not only puts her in conflict with her parents but also with the rest of the white residents especially after she defends an elderly black man who is beaten for drinking out of a whites only water fountain. This is the time of the Civil Rights Movement where those who felt threatened by this wave of change employed the Jim Crow system of "terror as a means of social control". Despite being a fictional work, a great many of the reviews from readers who had lived through this ugly period of USA history complimented the book on its authentic content. It is at times violent and confronting but it is also a love story about those thrust together at a time of conflict. And the unexpected twist at the end is a bonus. An excellent book and incentive to read the following two in the series.